I'm excited to welcome Erin here today from Making Memories...One Fun Thing After Another. She share lots of kid-friendly ideas, and today, she's showing off some of her favorite Easter ideas. I love how simple these are. I definitely want to make some of these little cookie bit nests. Erin has lots of other fun ideas on her blog too, so be sure to head over and say hello. Hi! 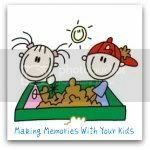 I'm Erin from Making Memories... One Fun Thing After Another. I'm so honored that Polly asked us to be here today. Me? A guest blogger? Who knew! Thanks Polly! We've been busy around my house with company in town and all the prep for my daughter's 7th birthday. But in the back of our minds, we've been thinking about Easter and what great projects we're going to do this year. We just love Easter! Last year we had a great time planning and baking and crafting. I thought I'd share some of our creations with you. These Easter Egg Hunt Cookies were absolutely delicious! They are cookies filled with Cadbury Cream Eggs (or caramel eggs) and then topped with more goodness! My kids loved making our Dye-ving Dudes! Who wouldn't, right? I don't know about all of you, but I just love sending mail to family members. And did you know you could send an Easter egg in the mail?!?! When I saw these adorable Carrot Patch Cookies I knew my daughter would love them. They were pretty easy to make and were quite the hit with the kids! I just love spring/Easter colors. All the pastels are so festive and fun. Add some pink to anything and it becomes Easter-y, right? Well, we went with it when we made our BYU Brownies. We can't wait to post all of our ideas for this year! Come on over and say hi and see what we've been up to!